Planning to go off-roading around Lakewood? The new Jeep Wrangler JK has you covered with features like Hill Start Assist, Electronic Roll Mitigation, and Electronic Stability Control. Not to mention, you’ll wow your Federal Way neighbors on your way to your favorite Puyallup restaurant. Below, you’ll find 1 new Jeep Wrangler JKs for sale. If you see one you like, take a few moments to get pre-approved for a Jeep lease or financing! Why Buy a New Jeep Wrangler JK from Us? That’s easy! Our inventory is massive; we offer a selection of not only Jeeps, but Chrysler, Dodge, and Ram vehicles as well. Whether your heart’s set on a powerful off-roader like the new Jeep Wrangler JK, or you’re looking for something more practical like the Chrysler Pacifica or Dodge Journey, we can help you find it! Additionally, we’re a trusted source for automotive information, such as how to trade-in your car or how to lift a Jeep! 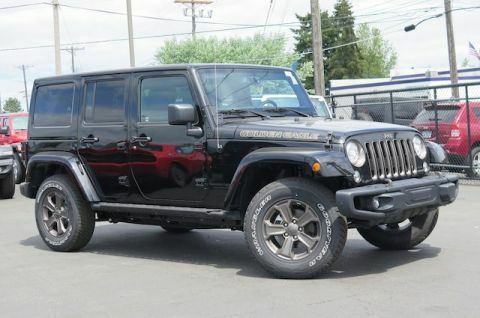 If you have questions about the new Jeep Wrangler JKs above, contact us or visit us near Federal Way and Puyallup!